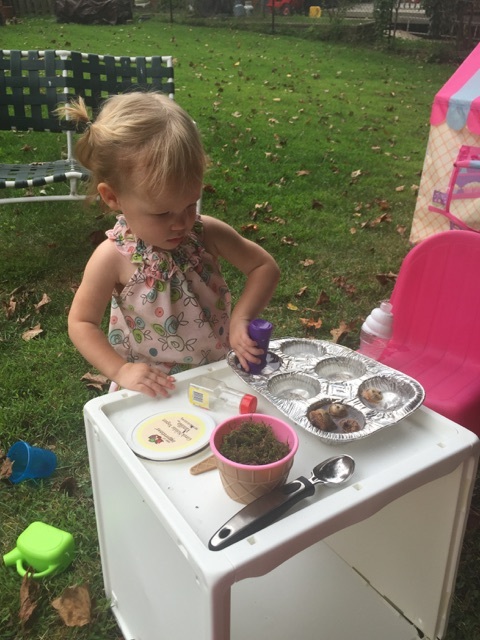 One of my favorite education bloggers, Angela Watson recently wrote about maintaining a forty hour work week as a teacher. This resonated with me because this is an area where I've been forced to grow as a teacher. I still struggle with the guilt of whether or not I can be a good teacher without putting in those long hours. When I first started teaching I put in 12 hour days as though someone was going to hand out medals for long hours in the building. I hoped that those extra hours would solve the behavior problems, help me maintain a better pace for the focus lessons, or magically make all of my students better readers. The days slowly moved from 12 to 10 hours in the building with more work to do at home for years. During those years I believed that putting in those extra hours was what was going to make me a great teacher. It was a young, misguided thought, but it was what I believed. Being young, with no family at home, and many of my friends at the school itself, it was easy to spend the majority of my time doing school related work. Then I decided to start my phd and I spent a year racing out of school as soon as I could so that I could get into downtown DC for my classes. Suddenly I was forced to put up boundaries with my time and prioritize my work. It felt ridiculously difficult and I struggled that year wondering if a phd was really going to be worth it if I didn't feel like I could devote enough time to my job. Those kids deserved more than a teacher who had to leave at 4 to go home to her stats homework, I often thought. Of course a new development overshadowed the phd- I became pregnant and the following year I wasn't racing off to a stats class- I had a baby at home and a daycare that closed at 4:30. I no longer had a choice about staying late and I couldn't contemplate quitting motherhood for my students like I had with my doctorate program. I had to find a way to balance my work. It's been a five year journey of trying to maintain a 40 hour work week, or really, let's be honest- a 50 hour work week. What strikes me the most is that I know it is doable, and I know that I can still be an extremely effective teacher without putting in the extra time. It's the guilt that eats me up. So many teachers do stay late and put in those long extra hours that I often feel like somehow I'm not as dedicated or devoted to my profession as I could be. As though I'm missing my membership in the 10 hour+ club, which somehow is also the same as a membership to the great teachers society. It's not. It was a hard realization to come to because I had so many years of putting in long hours, and being proud of the extra work I devoted each day. Slowly realizing that I can prioritize and work more effectively has been difficult. One of my former colleagues, who was excellent herself at maintaining a 40 hour work week, talked about those who viewed teaching as a religion and those who understood it was a job with boundaries. This always stuck with me, probably because when she said it I was in the religion camp (at the time the comment stung). Back then I saw teaching was the most important job anyone could do, and every moment I spent on my students as being sacred. It also meant I could be sanctimonious about those who didn't put in the long hours. As the years have changed and I've grown up I have moved from seeing it was a religion to a profession. A very important profession, but not one that needs to demand every moment of my day. A good, effective teacher does not depend on the extra hours the teacher puts in during the day, but how well the students learn. This is a profession that can eat you alive if you let it. There is always more to do and never enough hours in the day. I don't think a day has gone by in 12 years of teaching when I walked out of the building without feeling like there was more to do. Even after working a 12 hour day. But we are more effective teachers when we are at our best, well rested, and have a healthy big-picture perspective. Angela Watson's latest post is about prioritizing tasks during the day when you are trying to keep to a 40 hour work week. She has some excellent tips here. Some of these I wish I had learned sooner in my career. As a profession we need to help each other maintain our sanity and keep realistic hours. We can't let ourselves get sucked into the trap of feeling like we are only doing our job if we are going above and beyond. Too often we pressure each other into over doing it and create a culture of expecting those long days. We burn each other out, which isn't good for us or our students who need us at our best every day. The reading specialist and I sat down with a small group of fifth graders to let them know that they'd been selected to participate in a drama club two days a week during their lunch time. Many of them participated in readers' theater at the end of last year and we'd noticed just how involved they'd become with the plays. In fact, one boy kept asking me when he can write his own play, and after every book we read the group asks when we can put it together as a play. If they were this interested in putting on plays we figured we needed to follow their lead and give them the opportunity. The group is made up of students we know are interested in plays, but also a group of students who need extra practice to read at grade level. We're hoping the drama club will help with their fluency as well as their ability to discuss characters, main idea, and promote a deeper understanding of comprehending the text. The group cheered when we told them. They applauded and laughed with excitement. One girl asked what drama was. Once she understood then she smiled with satisfaction at the idea. Another boy asked if this meant he got double reading, and when I said yes, two days a week, he cheered again. We'd basically just delivered the message that they were going to miss lunch with their friends twice a week in order to do extra reading. And they couldn't stop smiling, which of course meant we couldn't stop smiling either. Their reaction to our news will continue to play on my mental highlight reel when I think about reasons I love my job. It felt like Christmas morning. Today is our first day and -fingers crossed- hopefully the energy will continue. I hope that following this group's interest and passion will help us close the gap and send them off to middle school reading on grade level. This is our last chance with this group of students and we owe it to them to do everything we can to give them the literacy and critical thinking skills they'll need the rest of their lives. Why not have fun doing it? About an hour into the first day of school a kindergartner began to sniffle, trying to hold back his tears. When I approached him he whispered, "I miss my Mommy, my Grandma, my Auntie and my sister. I want to go home!" I led him over to the schedule and showed him what he'd do today so he'd know when he got to go home to his family. As I finished his eyes widened. "Miss," he whispered, "you forgot nap time!" "Oh, there isn't nap time in kindergarten," I had to say, feeling like the meanest woman on earth. "But there is quiet time. You can look at books." He didn't appreciate my feeble attempt to sell it. "No nap time?" he whispered, in true horror. Slowly and sadly I shook my head. "No nap time." The boy's big eyes have haunted me all week. "No nap?" As though he was questioning what kind of place he'd been sent. Those eyes were a good reminder to not expect students to already be where I want them to be the first week of school. To slow down and teach everything I want to them to know and understand. To be slower and more understanding as children learn routines. 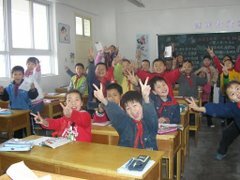 Not to change my expectations of what they learn, but to be more understanding as they learn them. Before we know it October will be here and the students will all know the routines and be comfortable with what we expect from them. Until then, I need to keep in mind where they are coming from as a way to remind myself to be patient as we adapt together. For one last summer get away my family and I snuck off to the Blue Ridge Mountains for a few days. It was a glorious get away, and one of the highlights of the trip was exploring the Play Trail at Boxerwood Gardens in Lexington, Virginia. 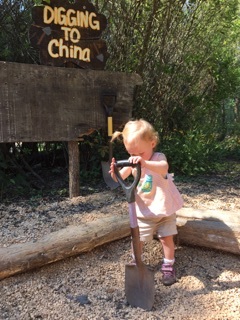 It was magical, and if we hadn't been interrupted by our growling stomachs we could have stayed there forever, eating in the mud kitchen, digging to China, playing with the life-size Lincoln Logs, running in and out of the various hidden tree-formed play spaces, and just generally getting dirty outside. 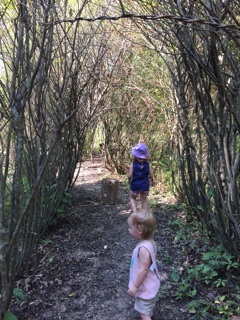 There was somewhat of a sense of magic that seemed to linger over the play space as children kept discovering new wonders around every turn. 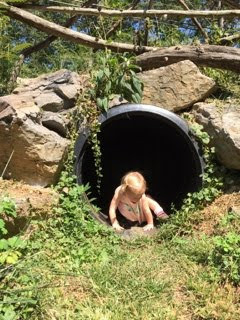 Some of these wonders were planted there by the designers- the tunnel, the mud pie kitchen, the play camp fires- while other wonders were just there- the moss, acorns, trees, leaves, and flowers- that would have been overlooked on a suburban playground. 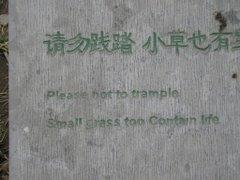 Here, those small natural treasures called out to be played with. 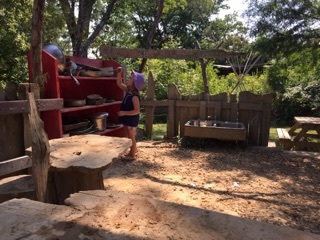 Both of my girls absolute favorite part of the play trail was the mud pie kitchen. 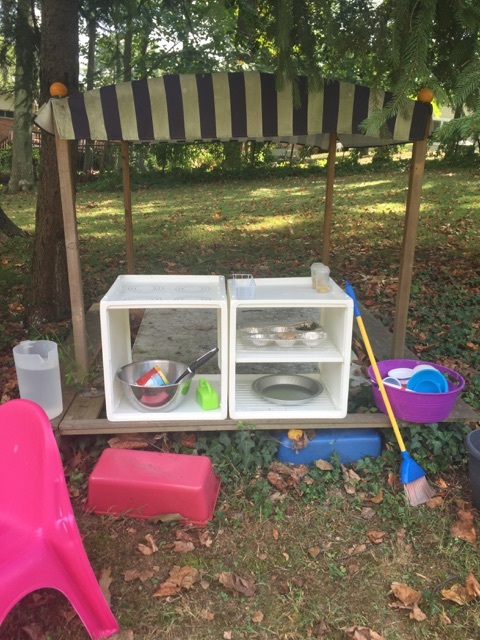 It had a kitchen area complete with a life-size sink and two shelving units where children can select the perfect pan. 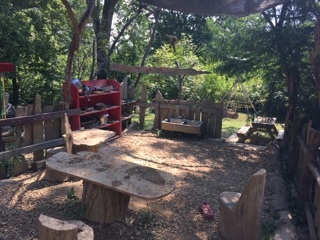 Next to it was the "Dirty Bistro" where the creations of the mud kitchen could be served to friends or adults. 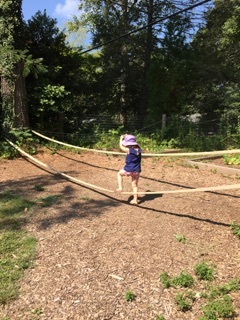 Notice the stump-stairs on the walk up encouraging gross motor skills. 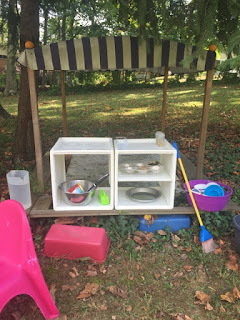 Nearby was a wash station stocked with scrub brushes where the children could un-mud the dishes. I noticed this was extremely popular, not just with my own daughter but with the other visiting children as well. 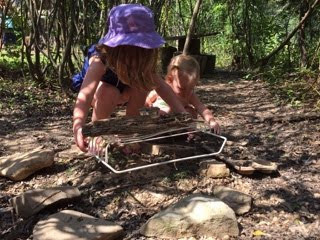 I watched my suburban girls slowly become comfortable with scooping up mud, moss, and sticks. 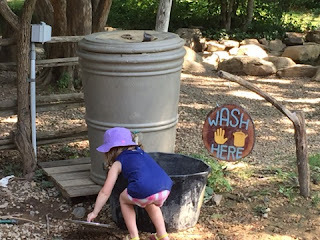 My particular four year old stopped worrying about getting mud on her shirt and started looking for little nature finds- special rocks, twigs, and grasses- to put into her mud pies. 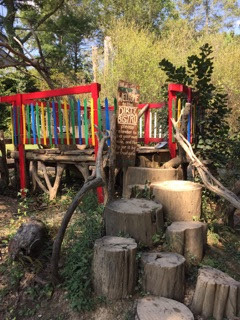 We need more of this- places that light a match to the imagination without handing the child an already created play scheme. More play spaces that foster exploration and creativity, encouraging our little ones to use their gross and fine motor skills in a natural, spontaneous way. 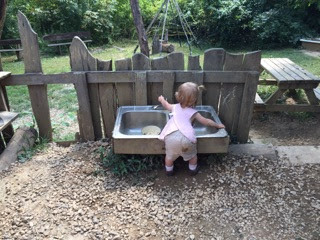 After our amazing morning exploring the Play Trail at Boxerwood Gardens in Lexington I decided we needed our own mud pie kitchen in our back yard. A trip to Target produced three of these plastic cube crates- two for the kitchen structure and one for the table. 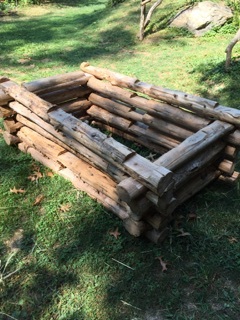 A black sharpie let us draw burners on the top of one crate to get the sense of a stove. We stocked the kitchen with supplies from the Dollar Tree- cooking spoons, pans, measuring spoons, a scrub brush, and mixing bowls and then we supplemented with other supplies we found in our own house that were begging to be re-purposed. In a very short time for not much money we suddenly had our own mud pie kitchen. All of a sudden my girls went from not wanting to walk in the grass with their shoes off to exclaiming in delight when they found nature treasures- acorns, pine needles, yellow leaves- hidden in the grass. Nature become an opportunity for imagination and exploration as opposed to an irritation to be dealt with while getting to their other toys. They were spontaneously engaging in fine motor tasks I could have spent time and energy creating for them inside. 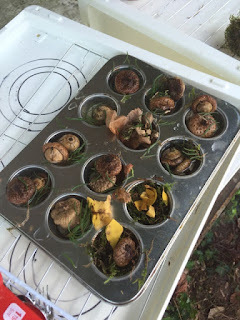 They pulled pine needles off branches to use as sprinkles, shredded leaves, pulled apart moss, and used an ice cream scoop to transfer acorns from one bowl to another. We've lived in our house since November and until now I never felt like we were using our backyard. We'd occasionally use it for activities, but my girls never embraced the fact they were outside. 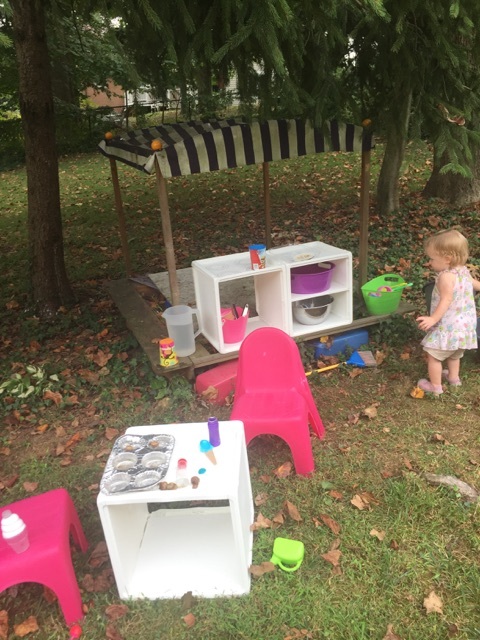 Now they are exploring parts of the yard they hadn't gone to before and are looking at every leaf as a potential pretend ingredient. This is what I wanted from a yard when we moved out to the suburbs but it's taken me this long to find it. 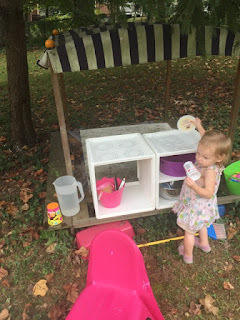 I put the kitchen on top of an old sandbox we don't use anymore. A few weeks ago, when it was still deep in the midst of summer break and actually being in school felt like a world away our administration sent an email with important dates for the first week back. As I studied it my heart sank. Our back to school/meet the teacher/ open house night is on Thursday evening- the same evening as my daughter's fourth birthday. My daughter has been talking about her fourth birthday since the night of her third birthday. To her birthdays are bigger than Christmas. If you say a month of the year she can tell you who from our family, extended family, or group of friends has a birthday in that month. My school, on the other hand, is trying a new back to school night where we combine the meet the teacher evening into the same back to school night that traditionally takes place a few weeks into the school year. The PTO will have food trucks outside and we are all expected to be there from 5-8 to meet parents and children, answer their questions, and present the important information needed for the school year. I've been really excited about the way we were wrapping multiple events into one fun night and had been looking forward to being a part of it to make it a smooth night for both family and staff. My amazing administration said it was fine if I left to be with my daughter, which is my current plan. Not being a classroom teacher means that I would really spend the evening helping with crowd-control. She's nervous about starting preschool and I don't know how I would explain to a four year old that I can't be at her birthday. But the guilt is crushing. Everyone else on our staff is going to be working a full 12 hour day- from 8am-8pm. Everyone else is working hard to make the night go smoothly, calm parent fears and get the students excited. I should be there as a part of the team. My daughter will one day forgive me. Or she can add it to the list of things to talk about in therapy when she's older- when once again mommy left her to be with other kids. There is no winning. Some moments I think that my daughter will understand and it's my professional responsibility to be there. Other moments I think that my family comes first and I'm doing the right thing by going home this evening. Whatever I choose I will feel awful about and will regret not making the other choice.